This type of weaving originated with the Tsimshian and spread to other groups through marriage and trade, but the Chilkat Tlingit of Alaska developed a style that was greatly desired all along the coast. The blankets are finger-woven using strips of cedar bark wrapped in yarn made from mountain goat wool, as the warp (vertical strands), and dyed mountain goat wool, as the weft (horizontal strands). The yellow, blue, and green seen in this blanket were made with natural dyes, but by the late 1890s these were replaced with commercial dyes. 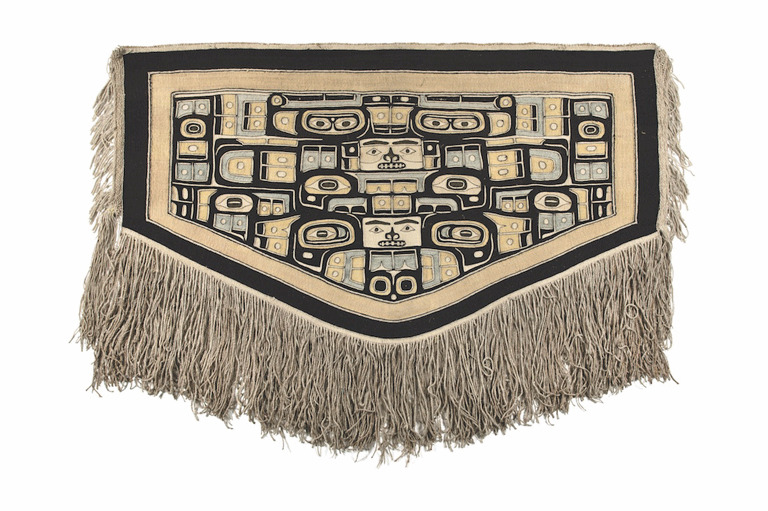 Both men and women played a role in the creation of a Chilkat blanket. The men designed the pattern and made the pattern board and loom; the women gathered the bark, prepared the yarn, and wove the blanket. Making a Chilkat blanket takes about a year. The blankets are intended to be worn over the shoulders for ceremonies and dances. This article originally appeared in the October-November 2016 issue of Canada’s History. This article also appears in French. Long before Confederation, Indigenous people lived under their own complex system of rights, rules, and responsibilities.